Home → News → Lamborghini Austin Partners with RIDE.DRIVE.GIVE. Lamborghini Austin is proud to announce its partnership with RIDE.DRIVE.GIVE. for 2019, benefiting the Center for Child Protection! Friday March 15, 2019 at Circuit of The Americas! Join us in the mission to help raise awareness and proceeds to benefit the children that the Center for Child Protection are fighting for! This event’s proceeds will all be donated to the Center for Child Protection. 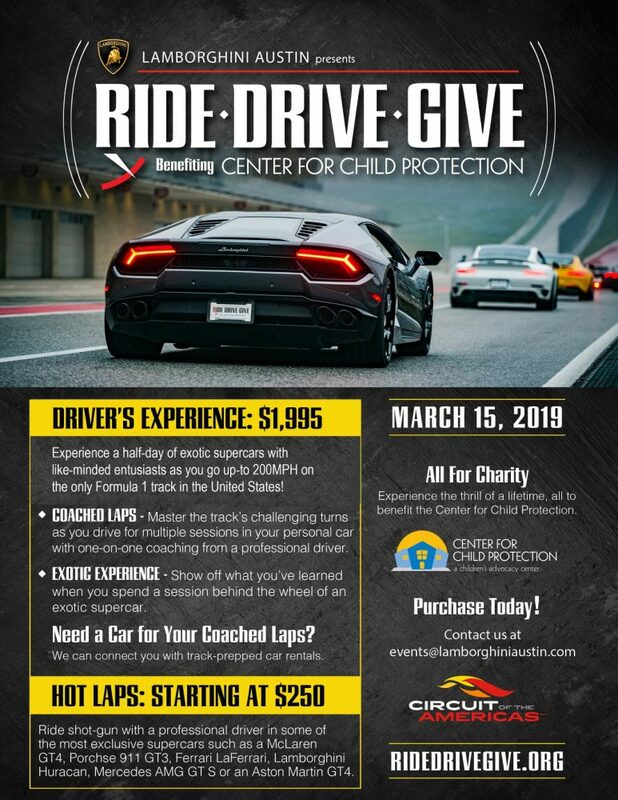 Please join us for a great cause, as well as the experience of driving the famous Circuit of The Americas F1 track right here in Austin, TX! Contact Dean Turnbaugh to book your experience!